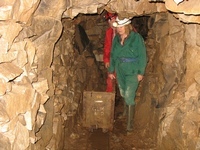 The Club has actively explored in a number of mining sites in Derbyshire. The table below shows just some of these sites and you can click on the links to see more details on this page or a separate page. Golconda Mine in Derbyshire is accessible from a single 360 foot deep shaft. Extensive workings radiate in all directions as the "Old Man" searched out the lead in flat loads. Several workings enter natural caverns notably the Great Shack (the term Shack was given to any open caverns found by the Old Man). 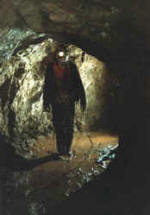 The Derbyshire Caving Club surveyed this mine in the mid 1980s with the help of the Wirksworth Mines Research Group who control the access on behalf of the owner. Workings date to the late 1700s when lead was so prized that the Derbyshire miners picked the seams down to a quarter of an inch wide. 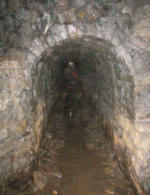 Bage Mine has a 303 foot deep shaft with several levels which leads to workings in the vertical veins, most of these passages are only 4 to 5 feet high. The mine is very extensive and the Wirksworth Mines Research Group has been exploring and digging in this mine for many years. The picture shows Paul from WMRG pushing an original miners tub on the 303 level in Bage mine taking timber to a dig, Wirksworth. The group is based at this mine and leases the old mine building as a club hut. The hut is so close to the shaft they are able to winch from inside the building. Many of the mines in Derbyshire were administered by the miners Barmote Court which still administers mineral rights, this ancient court has been in existence for over 700 years. A jury of 12 miners and miner owners still meet several times a year in the Moot House in Wirksworth. If you discovered a new vein of lead, on payment of a freeing dish of ore about 65 pounds in weight the Barmaster would register the vein and free 2 meers of land along the vein. A meer is 29 yards in Wirksworth. However if you abandoned your mine anyone could claim it by requesting the Barmaster to put a "Nick" in the stow (windlass) on 3 consecutive weeks after which it would become yours on payment of a freeing dish of ore. This may be the origin of the slang use of "nick" meaning to take. Photos on this page copyright Pete Johnson or DCC. 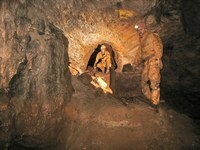 To find out more about mining, caving or tourism in the Peak District, try some of these links.